Traditional metal braces are highly effective, tried and true. If invisible treatment isn’t a necessity for you or your child, traditional metal braces might be the best type of braces for you. The brackets of metal braces are made of high-quality stainless steel and are smaller and durable. Stain-resistant colored ties come in a multitude of different colors, so you can choose to support your favorite team, celebrate a holiday, or just have some fun dressing up your teeth. With today’s technological advances in the field of orthodontics, metal braces might be the perfect fit for your unique orthodontic treatment needs. Invisalign is often a top choice for patients if they don’t want to look like they have braces. Invisalign invisibly straightens your teeth over time through the use of plastic trays called aligners that each represent one step in the process of straightening your teeth. Through a computer simulated process, the aligners are created especially for you, your teeth, and your unique orthodontic treatment process. Invisalign® is available for adult and teen patients. Dr. Herzberg is an Invisalign provider in New Rochelle, NY. To find out if you’re a candidate for Invisalign, give us a call at 914.632.2955 or click here to request a complimentary, no-obligation New Patient Evaluation for orthodontics. Dr. Herzberg is an Invisalign Teen provider in New Rochelle, NY. 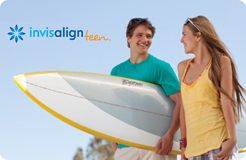 Look no further for a clear, removable, and comfortable treatment option, with Invisalign Teen. As a teen, you’ve probably heard that getting braces means you wont be able to enjoy your favorite foods. That may have been true for traditional metal braces, but with Invisalign Teen, enjoy eating anything! Your Invisalign Teen aligners are removable, meaning you can eat everything your love without losing brackets. Your Invisalign aligners are not only durable, but super comfortable. You may be wondering if having braces will limit your extracurricular activities. Whether you’re running the 100-meter dash, out on the field throwing a football, or playing the trumpet, you are not limited by your braces! Damon braces combine tieless (also known as self-ligating) brackets with a high-tech archwires. Instead of using ligatures or tiny rubber bands to hold the archwire in place, Damon brackets feature a slide mechanism directly on each bracket. In some cases, this can lead to reduced treatment visits to our New Rochelle orthodontics office, extended appointment intervals, and shorter overall treatment times. Dr. Herzberg is a Damon Braces provider in New Rochelle, NY. If you’re interested in discussing Damon braces as an option for your orthodontic treatment, we can evaluate your unique needs to make the best decision about which type of braces will work best for you and your individual needs. Depending on your situation, Damon braces may be the perfect fit for your orthodontic needs. Incognito and Harmony braces are braces attached to the tongue-side of your teeth, making them another great invisible type of braces. They are custom-made for your unique teeth and individual orthodontic treatment needs. Because the brackets are attached to the backs of your teeth instead of the front, no one can see them when you smile. This is perfect if you have a job in which your smile plays an important role, or if you simply don’t want to look like you’re wearing braces. Are you a candidate for lingual braces? Give us a call today at 914.632.2955 or request a complimentary, no-obligation New Patient Evaluation to learn more. Ceramic braces are made of translucent (clear) material, making them a popular type of braces. If you’re considering orthodontic treatment and would like your braces to be subtle, clear ceramic braces might be a good fit for your orthodontic needs. Through technological advances in recent years, clear ceramic braces have come a long way. They’re sturdier and more stain-resistant than ever before, making them an option for more people seeking orthodontic treatment. Dr. Herzberg is a clear ceramic braces provider in New Rochelle, NY. To find out if clear ceramic braces would be a good treatment option for your orthodontic needs, please give us a call at 914.632.2955 or click here to request a complimentary, no-obligation New Patient Evaluation. Insignia is software that allows our New Rochelle orthodontist to create customized brackets and wires specifically for your mouth through computer simulation in 3D. Your teeth are like fingerprints – completely unique to you and only you. Insignia software allows our New Rochelle orthodontist to customize your braces especially for your teeth, making orthodontic treatment more pleasant, as well as more effective. If you would like to begin the process of getting orthodontic treatment or have any questions, please give us a call at 914.632.2955 or click here to request a complimentary, no-obligation New Patient Evaluation. To successfully complete your orthodontic treatment plan, patients must work together with our orthodontist in New Rochelle, NY. The teeth and jaws can only move toward their corrected positions if the patient consistently wears the elastics (rubber bands), headgear or other appliances as prescribed. Jasper Jumpers reduce overbite by encouraging the lower jaw forward and the upper molars backward. This fixed appliance is usually worn for about four to eight months. A positioner may be used to complete the final tooth movements in your orthodontic treatment.